Great Deals Available Online Right Now! Genesis is Mold Proof - Mold problems are costly not just in remediation, it causes sickness in customers and staff reducing profit and productivity. Genesis is Bacteria Proof - Bacteria is harbored in most tiles and is another cause of illness. 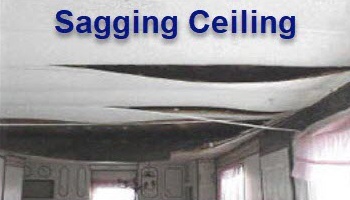 Genesis is Sag Proof - Sagging ceiling tiles are an eye sore and in time can fall out and cause injuries. Genesis is durable, install it once and you are done. 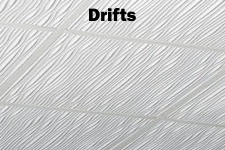 Most other tiles will cost you 1.5 - 6 times your ceiling install over time. Genesis eliminates the Maintenance cycle, no more R&R as Genesis maintains its new appearance over time. It is simply a janitorial issue. 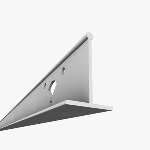 Genesis' thickness of 5/32" for 2x2 Ceiling Tiles and 3/16" for 2x4 Ceiling Tiles makes it last a lifetime. Genesis Grid, Vents & Returns are rustproof and chip proof. Others can rust and chip. Each of our ceiling tiles are engineered to last a lifetime and has the proper thickness for the purpose it was designed for. Genesis is Literally the last ceiling you will ever have to install. Lies about Ceilings - Some Companies are quick to say "Our Ceiling Tiles Are Class A"
While it is true that Class A is required on all indoor materials, to meet that requirement the ceiling tiles must be class A for both Flame Spread Index (FSI) and Smoke Development Index (SDI). Unfortunately, many claim to be class a while only meeting one of these criteria. This leaves you liable for damage and injuries in the event of an insurance claim. Fortunately Genesis Ceiling Tiles are Class A for both FSI and SDI. And Some Say "Our tiles are thick enough, and if not glue them to another tile"
Nobody wants their new tiles to sag, and the truth is most will because they are too thin. Gluing to the old tiles just adds your old problems to your new tiles. Genesis Smooth Pro 2'x2' is 5/32" thick and 2'x4' is 3/16" and specifically designed to never sag. Click an Image to View that Product, Use Arrows on sides of Image to change the View. Early in the 20th century as buildings grew taller, a need for false ceilings was developing to cover the piping, wiring, ducts, etc. that made the spaces useful. 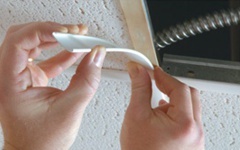 Over time new materials lead to easier installation but also introduced their own set of problems. At first it was the asbestos used to make the product fire retardant but caused long term serious health issue. Then came lead based products. 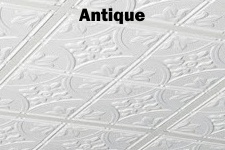 Modern acoustical ceiling tiles no longer have issues with lead or asbestos, but their simpler construction materials have made them more prone to impact and water damage. Fiber board tiles allow mold to grow, water spot, and sag - all caused by the introduction of moisture. 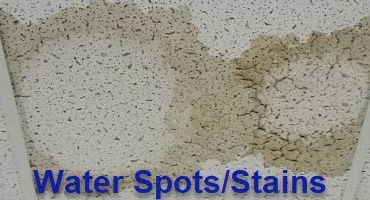 Moisture can enter the tile in many ways; roof leaks, pipe leaks, high humidity, but most commonly from AC Condensation. If you have an air conditioner you will have condensation. The problem with this is your ceiling is viewed by everyone who enters; just a glance will show sagging and waterspots. Imagine what they think if they see mold, and in this day and age, everyone knows that mold will make you sick. Sick customers cost you sales, sick employees cause lost productivity. Cleaning these tiles is problematical - They are easy to damage through handling and you can't use water to clean them, that would just make them worse. 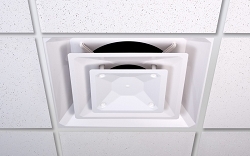 PVC Ceiling Tiles were developed to help but were initially designed to be glued to the existing acoustical tiles to keep them from sagging and falling out. Early tiles had issues with building codes and could not be called Class A as you must be class a for flame and smoke spread. Fortunately, Genesis Ceiling Tiles solve these issues. They meet the requirements of NFPA and Fire Marshals as they are class a ASTM E84 for flame and smoke spread. Health Department, FDA and USDA require for all food preparation areas to use a flat, smooth waterproof ceiling tile that can be cleaned easily. Mold proof, 100% waterproof, washable, bacteria proof and mildew proof. Rigid and Sag Proof, Their impact damage resistant design keeps the tile looking like new even when they have to be moved to work in the plenum. I am a disabled vet who was in ceiling contracting, R&R and New installs. 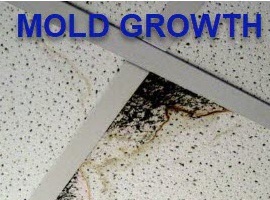 In 2005 we got a call about a restaurant chain that was closed by the health department for mold in the ceiling. We sent 3 crews working around the clock, 5000 sq ft (mold requires a separate waste container) took 2 days. But with the notice on the doors it hit the news and within 6 months the chain closed in Houston. My drive then became to come up with a tile that met all codes and would last a life time, so Genesis was born. Don't continue the cycle of replacing the same problem ceiling with the same materials and eliminate the problems of mold, spotting, sagging and damage from your ceiling with Genesis and turn that maintenance nightmare into a simple janitorial issue. There are a few online businesses that are selling a copycat version of Genesis tiles. They are a little cheaper but they are also cheap in the negative sense. In a couple of cases the tiles are touted as Class A but in order to be Class A the tile has to be tested using the USTM E-84 test method and pass the flame spread and smoke index. These tiles only passed the flame spread so they just claim to be “Class A for fire rating”. That is not a true Class A tile. It is a Class B. Additionally the thickness of the tile makes a big difference in how it holds up to sagging over time. The last thing you want is to have sagging tiles months or years after the fact. Our Genesis Pro series tile is the thickest, wont sag over time, actually is Class A with a burn report to prove it. A lot of testing, time and money went into making sure our tiles stand up to the test of time. Ceiling Specialists are hard to find - they need to be someone who can help you determine the right materials and quantities for your drop ceiling needs. Whether you need help with your layout, quantities, a quote, or just a simple question, Let our Ceiling Specialists help you at 800-518-9835. Genesis Smooth Pro ceiling panels are USDA, FDA and Health Department compliant and are recommended for use in federally inspected food processing plants, restaurants, commercial kitchens and central food preparation areas. Hotels, Hospitals, Doctor's Offices, Motels, Commercial Kitchens, Clean Rooms, Fast Food, Data Centers, Restaurants, Offices, Conference Rooms, Bottling Plants, Warehouses, Food Processing Plants, Dealerships, Show Rooms, Indoor Pools, Retail, Residential, Basements, and more. This is the only maintenance free ceiling. Literally the last ceiling you will need to install! New Ceiling Tiles, LLC. 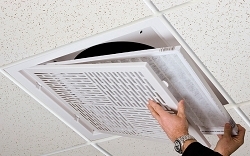 is a commercial website dedicated to providing quality commercial ceilings. We are here to meet the ceiling needs of the commercial sector. Our maintenance free ceilings consist of ceiling tiles, grid, grid covers, AC vents, air returns, diverters, deflectors, and more. We feature class A ratings for both smoke and flame on our products; they are waterproof, decorative, washable, sag proof, mold, mildew & bacteria proof as well as impact damage resistant. Our suspended ceilings are not like most of the ceilings you will see online. They will outlast them. 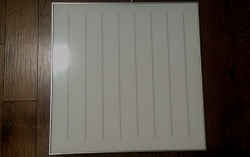 The tiles are thicker and more rigid.